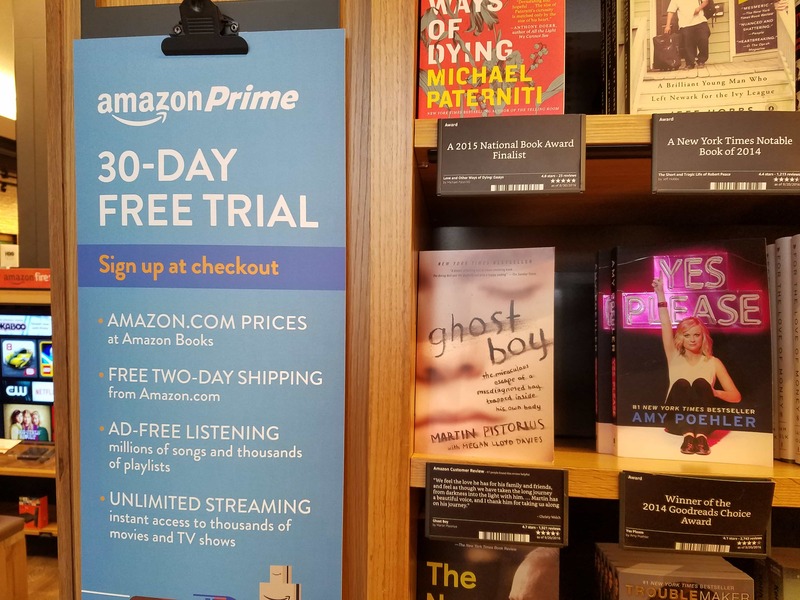 Remember how Amazon launched its bookstores so it could train customers on how to use its app and the rest of its services? Apparently Amazon is now using the stores to encourage customers to sign up for Amazon Prime. Geekwire reports that Amazon is celebrating the one year anniversary of the launch of the Seattle Amazon Books with a new pricing policy. When the store opened, Amazon charged the same price in the store as it did online, but now the low prices are a perk reserved for Prime members paying $99 a year. Everyone else now has to pay the list price for any non-Amazon hardware sold in its stores. The new pricing policy reportedly started in August, and have already taken effect at the stores in Seattle, Portland, and San Diego. Amazon is also in the process of launching to two more bookstores in Chicago and Boston. 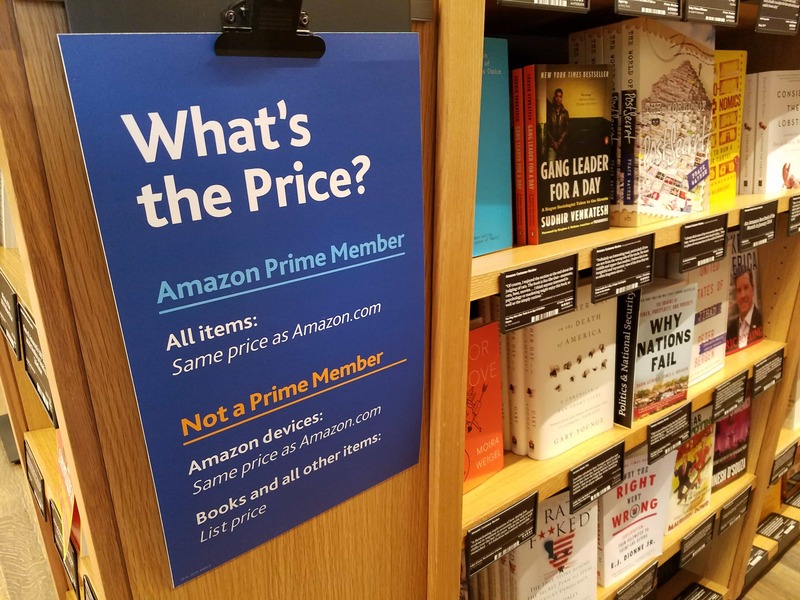 When I first read this I wondered if Amazon was simply making it easier for non-members to find the price; they might not have Amazon's app on their smartphone and thus finding and paying the list price would be easier than taking each book to a kiosk. But looking at how the kiosks highlight the price disparity, it's clear that Amazon's goal is to get visitors to sign up for Prime. (Also, there's no reason to assume only Prime members will have the Amazon app; I for example have the latter but not the former). Amazon isn't the first B&M retailer to tie its discounts to a membership program; many supermarket chains and other retailers offer discounts with a free membership card, and Borders and Barnes & Noble even charged for their membership programs. So in a way Amazon is copying their competition while going one step better; the Prime membership is worth getting. That said, I still have two questions. How would you prove to the cashier that you have a Prime membership? Also, how much do you want to bet that the receipt for non-members will highlight how much they could have saved? It is easy to check for prime, the cashier only has to check their email address. I think it is fine to give a discount for joining a company’s membership program. my email address is 20 characters long, so that is not as easy as you make it sound. Could this possibly be a response to all the people whining about antitrust and how the brick&mortar Amazon stores were undercutting the other physical stores because they were using an advantage granted to them by their online business? I live in Seattle and frequently shop at Amazon Books. When you pay with the card associated with your Amazon account, the system obviously knows you’re a Prime member. I’ve never gotten a printed receipt there because they just email me a receipt, just as if I’d ordered online. I don’t know how it works if you’re Prime but are paying cash or with a card not associated with your Amazon card. Are the non-prime prices fair? Competitive with other stores in the area? Chapters and Indigo, the Canadian ‘big box’ book stores I shop at, are very upfront (via in store advertising) about the fact that their online prices are cheaper than their in-store prices because warehouse-shipped products cost less than retail-sold ones do. If Amazon does the same, it just makes sense. Most indie bookstores charge full retail, so the non-Prime prices are not competitive. They will only need to ask most customers for their email address once. After that they will have it tied to your credit card, just like Square does. If you have already used your card to buy something on amazon.com they probably won’t even have to ask once. Amazon might not even need your email address. Look at how Square works for credit card payment. If you want your receipt emailed to you, you only have to enter it the first time you charge something to Square on the card. Every time you charge something on that same card via Square, anywhere, you’ll then get the receipt in your email, because Square knows that specific credit card number is you. It might well be Amazon could do something similar. If you’ve got a credit card registered with Amazon, for one-click purchases and such, if you swipe it at the store, Amazon could automatically know it’s you and give you the discount pricing. It would require swiping the card before the price was generated and the payment was actually processed, but I don’t doubt it would be a minor-enough thing for customers to get used to. They’re already getting used to scanning the books to find out what their price will be, after all. I think everyone is right about the credit cards. Amazon’s systems are probably smart enough to figure that out. Now that I think of it, I seem to recall Amazon Books already uses the Amazon accounts tagged to customers’ credit cards to know where to email their store receipts. It sounds more like an extortion to me than a promotion. Kind of. “Get prime, or else”. I would have stopped going in there altogether. If I lived in the US.